In order to pursue a conversation about reconciliation in my classroom, and to ensure that my voice as a non-Indigenous teacher does not become louder than the survivors, I constantly strive to include Indigenous voices in my classroom. I want my voice to amplify Indigenous voices, not speak over them, or for them. 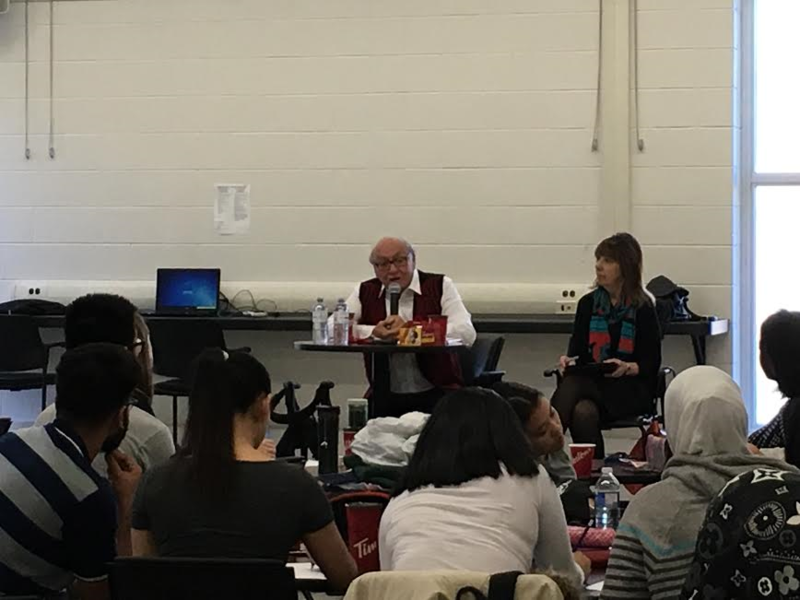 I was fortunate enough to be given the opportunity through Facing History and Ourselves to have Theodore Fontaine share his experiences with the Canadian Residential School System in my Challenge and Change Grade 12 University class. I wanted to create a safe space for this visit so I made sure to work extensively with my students to prepare them for his visit (to see the work leading up to his visit, see here). 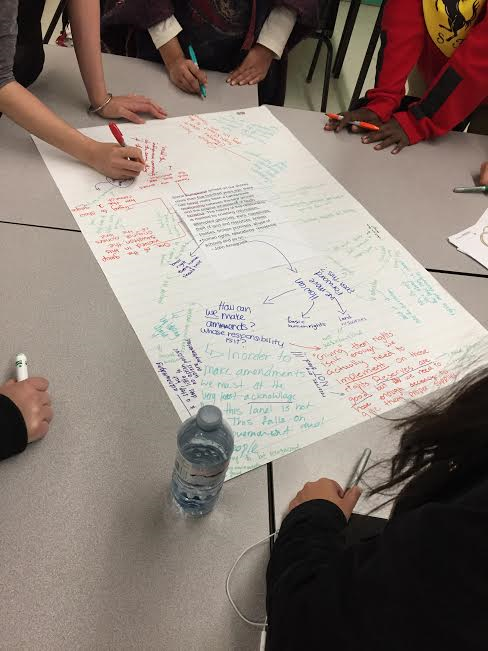 As I began teaching my students the history behind the Residential Schools and major perpetrators, reading other survivor testimonies from Stolen Lives: the Indigenous Peoples of Canada and the Indian Residential Schools, discussing the impact today and examining the use of the term culture genocide, I witnessed my students reframe their dialogue. Students’ expressions of apathy at the beginning of the unit turned to expressions of outrage, as they began to learn about how we, as Canadians, could let something so horrible continue. I knew then that my class was ready for Theodore. Before Theodore spoke to my students, they were exposed to a brief biography of his life so they were prepared for what was to come. We discussed proper etiquette towards welcoming and listening to Indigenous speakers and brainstormed questions to ask Theodore. All of this was done to ensure the utmost respect was shown while he was in the class, and to prepare students for their first experience with in life survivor testimony. While I felt I had prepared my students as much as possible, I don’t think they accurately anticipated what their reaction was going to be to Theodore’s testimony. There is something about putting a face to the accounts that really impacted the students as they heard his story of life before and during residential school, and his journey towards reconciliation. 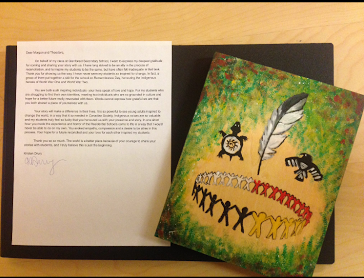 Afterwards, students went on to our class website to respond to the prompt: “How has Theodore’s personal story impacted your thinking on the history of the Indian Residential Schools and the TRCs Calls to Action?” Below are a sample of student’s responses. During Theodore’s testimony, students filled out a “head, heart, hands” worksheet to explore the heavy content of his story, as well as wrote down one quotation from Theodore that most spoke to them. They brought that with them into the class the following day for our debrief. Our debrief was structured to take them step by step through the worksheet: The head (their thoughts), the heart (their feelings) and the hands (the actions they want to take). We began with the head portion of their reflection. After sharing, it became very apparent to both the students and myself that the class as a whole was very moved, angry and passionate to act. 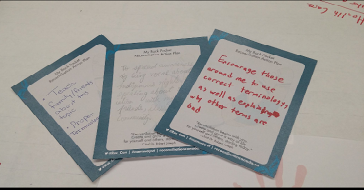 They then wrote on a sticky note the quotation that most spoke to them and shared it with the people in their table groups, identifying common themes, feelings and ideas that came as a result. Next, each table group began to create a visual representation that connected to Ted’s presentation, with the end goal of creating something to send to him. 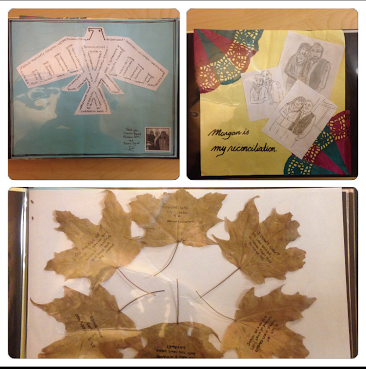 These creations were put into a scrapbook along with a letter from myself to show Theodore the impact he had on us. Students created things such as Found Poems, Visual Representations, letters and biopoems. This took place over several days, and it was amazing to see what my class came up with! Without any prompting, students began researching elements of the Sagkeeng First Nation, in order to be respectful of Theodore’s culture, and then incorporated their findings through images, symbols and colors. I wanted to end this mini unit with the “hands” portion of the reflection, empowering my students to take action, and to participate in reconciliation in their own lives. They needed an outlet for everything they had heard and experienced, and were given an opportunity to respond in a productive way. I scattered prompts around the classroom on pieces of chart paper, examining the major Call to Actions from the Truth and Reconciliation Commission. In small groups, my class rotated to each prompt and brainstormed what reconciliation looks like, sounds like, and feels like. This led to an in depth conversation over our individual responsibility, as well as brought to light what it means to perpetuate the discrimination if we fail to engage. Students felt like they were called to act, even in a small way, in our school and community. I didn’t want to let this go to waste, so I gave each student a piece of paper where they wrote down their own personal commitment to reconciliation, and had them tweet it out to help hold them accountable. I wish I had longer to spend on this topic, as it led to some of the richest conversation in that course. In fact, on our final exam, students were drawing on specific details from this unit as they evaluated the level of inequality in our society. I heard a significant change in the way they talked about issues, both in classes and in the halls. I would like to think that their world views changed a little because of Theodore Fontaine- I know mine did! How do you address student apathy and raise the possibilities for creating meaningful change in your classroom? How do you debrief survivor testimony? Interested in learning how you can bring the history of the Indian Residential Schools into your classroom? Check out the new Stolen Lives: Indigenous Peoples of Canada and Indian Residential Schools Summer Seminar, which will explore the history of Canadian Indian Residential schools, their long lasting impact, and Canada’s path to reconciliation through primary source texts and survivors’ personal testimonies. Kristen Drury is a history, social science and ESL teacher with the Peel District School Board. She currently teaches at Glenforest Secondary School. Kristen is passionate about finding ways to help students engage with history and wants them to feel challenged to take action. She strives to find new ways to incorporate inquiry based learning and critical thinking into her teaching practice. Follow her on twitter at @Ms_Drury.